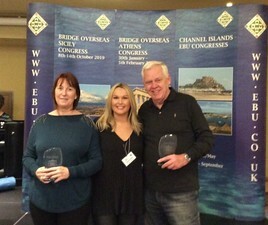 The Overseas Congress in Athens, sponsored by Bridge Overseas, concluded yesterday. Sue McIntosh & Philip Cooper (picture here) were top in the Swiss Pairs, finishing with 140 VPs. Mark Westley & Maria Budd were second with 135 VPs, and Kathy Talbot & Denis Talbot were third with 131. In the Swiss Teams, the O'Hara team - Sue O'Hara, Nelson Stephens, Ruth Edmondson & Brigid McElroy - finished on 127 VPs, 6 VPs ahead of the field. The team of Chris Taylor, Joyce Skelton, Kathy Talbot & Denis Talbot were second. The next Overseas Congress takes place in Sicily, 8th - 14th October.